There are still no news and more questions asked than answers one week after the kidnapping of two Italians and one Canadian in southwest Libya. Italian government was first to confirm the abduction of two of its citizens while Canadian government confirmed the troubling news almost a week later. 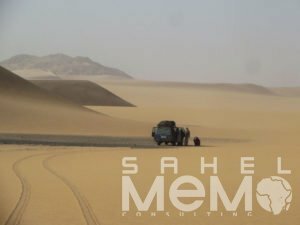 The three workers of Ghat airport were reportedly taken while traveling between Ghat and Tahala near the borders with Algeria. Surprisingly they were traveling without adequate security protection despite that the driver might have been armed, but who is not armed in the area? As of Monday, September 26th no group claimed responsibility leaving room only for speculations and questions. Because of the history of kidnapping for ransoms (KFRs) in the Sahel Al-Qaeda in the Islamic Maghreb (AQIM) have a strong track record to be considered the main suspect to be indirectly or directly behind the kidnapping. However this will be the first time the group have kidnapped foreign nationals in southwest Libya, an area AQIM mostly used for planning and movement of weapons. Since AQIM emerged a decade ago it relied on KFRs to finance its operations as it reportedly generated close to $100M between 2008 and 2014. Most likely hostages still in southwest Libya and has yet to be transferred to preferred areas by AQIM and allies, notably northern Mali where at least four foreign hostages are held. If AQIM is behind Ghat kidnapping, the group likely to seek ransom for their release from Canadian and Italian governments, or the company hostages were working for. This is encouraging for the abductors because both governments reportedly paid ransoms for the release of their citizens held in Mali. Image of a traveling vehicle in Northeast Niger, July 2015. Source: Sahel MeMo. bandits, the kidnappers appear to be well informed and knew foreign nationals were traveling on Ghat – Tahala route. This is similar to previous kidnappings claimed by AQIM and allies in Mali and Niger where the abductors always knew the exact location of their potential hostages. Not only that, but also able to execute without being captured. For instance abductors knew the house Swiss national was staying at in Timbuktu January 2016 and managed to escape despite presence of Malian and foreign forces in the city. Back in September 2011 abductors knew the exact rooms where humanitarian workers staying at in Tindouf. In November 2011, kidnappers knew there were western tourists staying at hotel al-Afia in Timbuktu. There are several reasons for the delay of claiming responsibility. First the transfer of hostages likely has yet to take place especially if the operation was conducted by armed bandits planning to strike a deal with AQIM or other suiters. Second the abductors might be attempting to reach a safe area which is not as easy as might seem despite instability. Movement of hostages might be challenging due to increased French patrol operations to crackdown on the movement of weapons and fighters with ties to violent extremist organizations (VEOs). If AQIM is behind the kidnapping they would ideally like to move the three hostages to northern Mali where the group still holding at least three foreign hostages. Hostages unlikely to be kept together at the same exact location to avoid loosing all hostages in one rescue mission. Northeast Niger is also an option but is a challenge for two reasons: French and Niger forces frequent surveillance and it’s more challenging in terms of logistics compared to northern Mali. Unlike in Mali and Algeria, AQIM and allies used southwest Libya to plan operations rather than carrying attacks, especially after 2011. For instance In-Amenas attack in Algeria January 2013 then Arlit and Agadez in Niger May 2013 were both planned by Mokhtar Belmokhtar men in southwest Libya.